*not valid with other coupon offers. 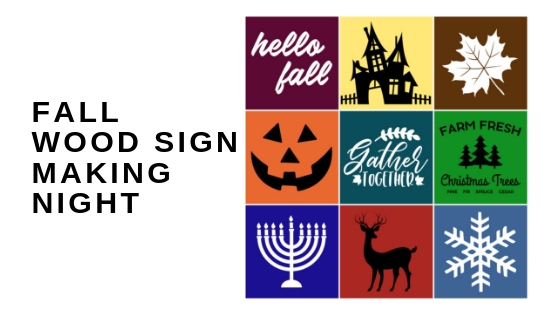 Join us for a two sided sign making night. We teach you all the basics to make your own wood sign, at a beginner level. There is no experience necessary! You get to choose a template for the front, and a template for the back…we have over 15 templates to choose from. Customize the color of the background with several choices of acrylic paint, and then choose your wood sign template from black or white vinyl. Don’t worry – we are there to help you every step of the way! Events after 4pm are BYOB. Feel free to bring your own snacks or food – and craft the night away! Arrive 15-20 minutes early uncork and grab your seat! If you desire more time to unwind, visit with friends and breathe before we get crafty, feel free to arrive up to 30 minutes prior to start time; get your Happy Half Hour on! PAYMENT POLICY: Payment is due at the time of the reservation to guarantee your seat. There is a minimum requirement of 8 persons for this event to be held – so invite your friends! REFUND/CANCELLATION POLICY: A store credit will be given for individuals with at least a 24 hours notice. “No shows” will not be issued store credit or refunds. Groups of 5 or more must cancel 2 days before the date of the class. (Please leave a voice message if calling after hours, (602)341-3570. If you are late to the class you may not be allowed to craft or paint and your payment will be forfeited. Visit our FAQs for more information. Craft Nights by The Hippie Hobby reserves the right to cancel classes for unforeseen circumstances. Registrants will be notified at least 24 hours prior to class.